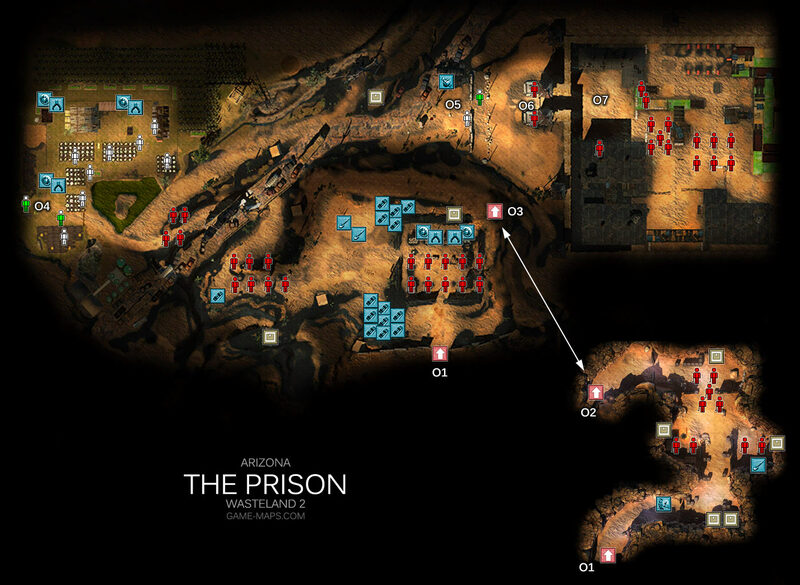 The Prison Walkthrough - Wasteland 2 Video Game Walkthrough with Maps & Game Guide. Quests, NPCs, Items, Secrets & Hints, Enemies, Skills to Use. 04 This farm looks like it dropped in from a better, happier world - a tidy little farm house surrounded by a white picket fence, fields full of crops, a barn full of healthy pigs and cows, and a white-haired farmer smoking a pipe on the front porch. It's so idyllic it makes you want to cry. QuestPrisonKill Commander Danforth and free Happy Valley from the Red Skorpions. Jobe, a laborer at Auwaerter Farm, has asked us to free Happy Valley from the Red Skorpion Militia. He doesn't believe taking out the Skorpions one by one will work, and has suggested that killing their leader, Commander Danforth, is the only way to truly finish them for good. QuestPrisonKill Commander Danforth and free Happy Valley from the Red Skorpions. The entrance to the Prison is fortified up the wazoo. We may need to beef up our arsenal - and our skills - a bit before we can get inside. NPCFindley-Tek Tactical System Mobility systems off-line. Sensors have detected a missing part. Mobility systems cannot engage until missing part is replaced. Please replace Part #TRL-01553 - Tank Tread. Use only genuine Findley-Tek parts. 06 Turrets - they are to powerfull for this time. 05 Use TRL-01553 - Tank Tread on Findley-Tek Tactical System, and select Inorganic, Turrets are gone. QuestPrisonKill Commander Danforth and free Happy Valley from the Red Skorpions. Team Echo polished off the Red Skorpion Militia, including Commander Danforth, just like Jobe asked. He'd probably be happy to hear about this. There is other peaceful method to solve Commander Danforth problem. You have to cure the dogs in the prison for Danforth using Jobe cure. You can also cure dogs and the kill Danforth. QuestPrisonKill Commander Danforth and free Happy Valley from the Red Skorpions. Commander Danforth has been killed and the farm is Jobe's once again. QuestRanger Citadel Head back to Ranger Citadel for a new assignment. Unless we hit a detour With Commander Danforth dead, the Red Skorpions will fall apart in no time. Problem solved.